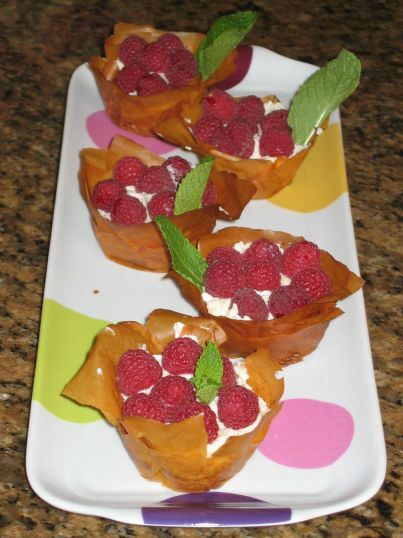 Phyllo cup with Mascarpone filling topped with Raspberries. We are invited to Hanh's house tonight and I wanted to bring a few desserts. What time it is? Darn! it is already 4:30Pm. I just lost track of time when I go shopping! What can I bake and be ready in about 30 minutes? Let's see...I have some frozen Phyllo dough in the fridge. Let's use it! . All I need to do is to line my muffin tins and bake the Phyllo dough for 10/15 minutes. Et Voila! I have the base now. 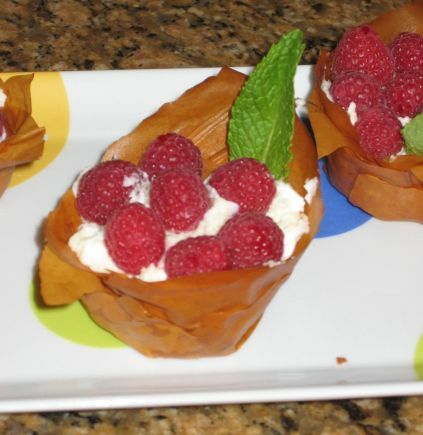 For the filling, I used some Mascarpone cheese, whipped cream laced with orange zest to give it a burst of flavor and I topped it with Raspberries. Not bad for something I whipped up at the last minute and they actually look and taste pretty good too. Now that I have one dessert ready I need to think of a second dessert! something quick but everyone will love.... Either Brownies or Madeleines? I settled on baking a few batches of Madeleines.